Oculus stormed into the world a few years back with the promise of Virtual Reality only to see it's thunder stolen by the HTC Vive with its motion tracked controllers then Sony VR ran that same bus over the Rift again. Now Oculus may finally have what it's been lacking to be a top shelf VR experience and that is the Touch motion controllers due to ship December 6th. These controllers, along with another included tracking camera go a long way towards making the Rift a true VR experience in most respects. It is difficult to sell a skeptical public on such expensive hardware without motion tracking as some game experiences will absolutely require tracked controllers to complete the immersive experience the game developers want to the deliver to the end user. First Person Shooters simply can't exist without this touch of realism. Well they can exist but it wouldn't as much fun on an Xbox controller. How about wielding a sword or for the not so heavy handed maybe even a shovel to dig for treasure or priceless artifacts? Maybe the joystick of an airplane or helicopter? These things require motion tracked controllers to please most of us because we are already a fickle lot in the world of VR. We want it as real as it can be. Also included is another camera that is supposed to help in the room scale department but recommended setup is to have both cameras facing you, three to seven feet from each other, which means you can occlude the cameras with your body by simply turning around. This might be a problem but I'll bet it gets figured out quickly if that is the case. A third optional tracking camera is available and it may alleviate some of the occlusion problems. Like the Vive controllers Touch is not going to mimic the hand with finger by finger manipulation but it can sense when your fingers are on the buttons or not as the thumb and forefinger react accordingly. If you've never used a motion tracked controller, then you are in for a treat. It's much more responsive than trying to do the "TV Weather" trick of using a camera capture like the Kinect then translating that to a flat screen. While that last statement is certainly over-simplifying it the difference in motion tracked versus the old camera tracked are like day and night. There is no comparison with motion tracking being far superior. For some players, the Vive wands became more than just extensions of their hands. They magically molded themselves into whatever device they were holding like a gun. In the Brookhaven experiment it even began to FEEL like a gun. It's yet to be seen if this is the case with the completely different design of the Touch controllers but the experience has as much to do with this as the shape of the controller at this point in VR development. Since the Rift is now stepping off into the room scale gaming environment there is a need for some safeguards such as its playing area boundary system, the Rifts answer to the Vive Chaperone. You walk off this system much the same as the Vive Chaperone process defining your play area. It does seem that the Touch controllers are indeed the missing piece of the puzzle that has held some of us back from really embracing the Rift. If you have both the Vive and Rift the lack of motion tracked controllers was more than noticeable. In fact, it was important enough to determine what apps and games were played by this author. It's like when a new game comes out now... if it's not VR, I'm not really interested in it no matter how advanced or mind blowing. And in VR if it didn't have motion tracked controllers, then I was not that interested in playing. Now the Rift, with arguably better graphics than the Vive is on the same playing field. 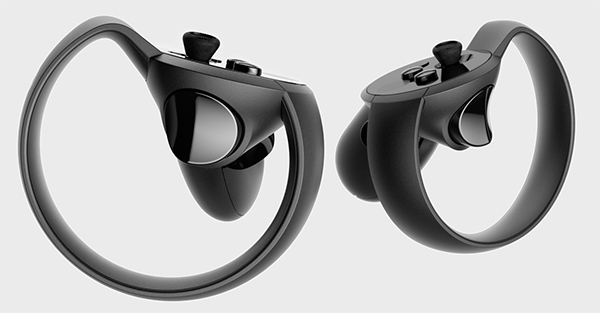 Oculus Touch at Oculus website.